U.S. Army Europe is America’s land power that is an ocean closer to every major security challenge America faces except the Pacific. The European security environment is changing. Russian aggression in Ukraine, Syria, the Black Sea and the Baltic Sea is creating multiple dilemmas for governments across Europe. Fears of Russian encroachment have reawakened throughout Eastern Europe while Russian activities in Syria have done little to reduce the number of displaced persons seeking refugee status in Western Europe. This, coupled with an ever-present terrorist threat by radicalized Islamists and the systemic stress of hundreds of thousands of refugees flowing into Europe, is causing unprecedented change in a complex environment. The most significant threat that each country in Europe faces today is based on geographic perspective. In Eastern Europe, Russia continues to challenge international order when it serves their own interests. Over the past two years, Russia has used military force to violate the sovereign integrity of Ukraine, Georgia and Moldova. Throughout Eastern Europe, Russia is contesting U.S. regional access and freedom of action with anti-access/area denial challenges in Kaliningrad, Crimea and Syria. Actions like these caused defense budget increases of nearly 20 percent by countries in Central and Eastern Europe from 2015 to 2016, with Hungary notably increasing defense spending by 22 percent. In Northern Europe, Russian behavior in the Baltic Sea is causing countries such as Sweden and Finland to openly debate joining NATO. A U.S. paratrooper in action during Exercise Noble Partner 16 in Georgia. 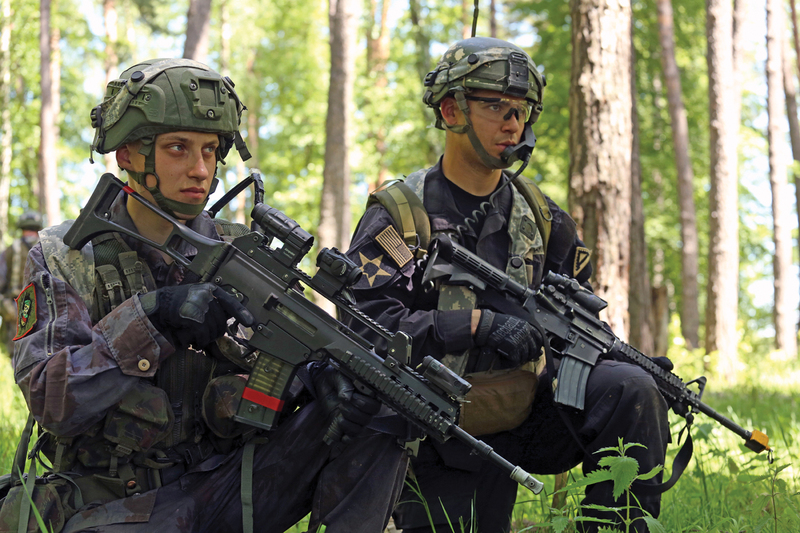 A Lithuanian and a U.S. soldier at the U.S. Army’s Joint Multinational Readiness Center, Germany. Countries in Western Europe are much more concerned with the threat of Islamic extremists executing a terrorist attack at a busy train station or concert venue in a metropolitan area than they are with Russian incursions into another state’s sovereign territory. Europe has endured 27 attacks since 9/11, including the recent attacks in Paris and Brussels, with a total of 480 people killed and over 3,000 injured. To counter this, many Western European nations are augmenting police forces and providing military support to intelligence operations. 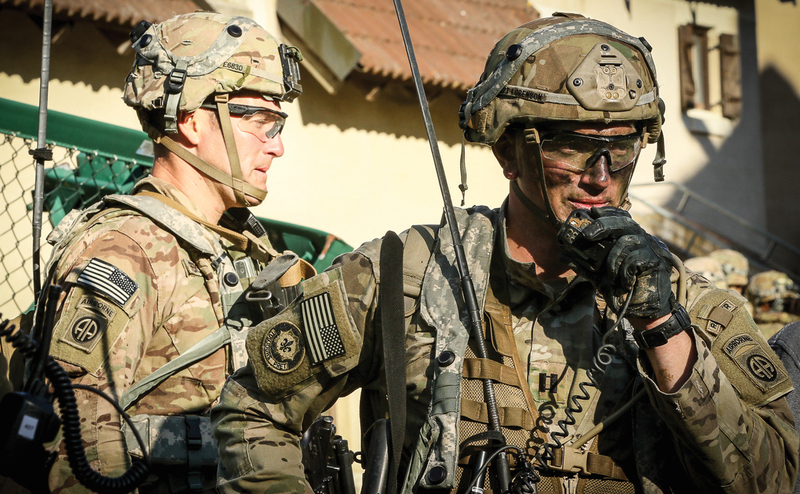 As part of the fabric of NATO, it is imperative that U.S. Army Europe (USAREUR) maintains a flexible stance that can deter multiple types of adversary activity throughout the continent. To do this, USAREUR maintains a high level of readiness for assigned and allocated forces. This level of readiness enables us to demonstrate a credible capability that uses speed to assume a deterrence stance against adversary activity. By positioning an ocean closer to America’s strategic challenges, U.S. Army Europe stands ready to provide a credible deterrence with our partners and allies. As a welcome addition to the Strong Europe team, U.S. Army Europe is set to receive a full armored brigade combat team on a persistent rotational basis in Europe. Starting in 2017, U.S. Army Forces Command units will deploy for nine-month rotations as part of Operation Atlantic Resolve, providing forces with the opportunity to train and maneuver as brigade combat teams in order to improve interoperability and achieve deterrence. America’s commitment of this capability to Europe demonstrates the Army’s ability to project and sustain forces in Europe. Together with U.S. Army Europe’s assigned forces, the armored brigade combat team puts real deterrent capability an ocean closer to a potential Russian threat. USAREUR is set to receive regionally allocated aviation forces on a rotational basis as well. Beginning in spring 2017, USAREUR will receive attack reconnaissance battalion and additional medevac rotary-wing platforms in Europe. This, together with an aviation support battalion, a brigade headquarters and headquarters support company, will fill out a combat aviation brigade in theater. These critical assets will solidify a deterrence posture with a forward presence at improved airfields throughout the Atlantic Resolve countries: Lithuania, Latvia, Estonia and Poland. To augment these regionally allocated forces, USAREUR will receive Army prepositioned vehicles, weapons and equipment in theater beginning this year. 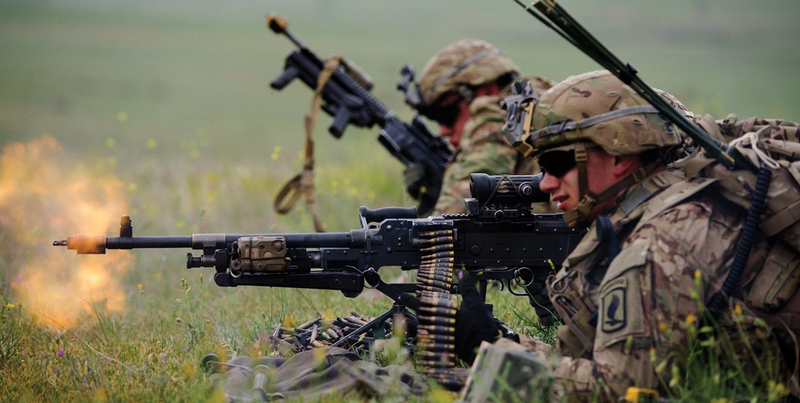 This Army prepositioned stock allows U.S. Army Europe the ability to assume a deterrence stance anywhere in theater and provides maintained equipment for additional forces to fall in on as needed. To ensure the infrastructure is in place to support this increase of U.S. Army forces in Europe, the European Reassurance Initiative (ERI) continues to provide critical resources that positively affect the operational environment throughout the USEUCOM area of responsibility. The initiative is instrumental in the positioning of Army prepositioned stocks, with the fiscal year 2017 ERI budget earmarking $1.9 billion to ensure U.S. forces are postured to deter across Europe. This contingency funding, which is critical to U.S. Army Europe’s mission, helps with the reassurance of NATO allies, security assistance support focused on Eastern Europe, and infrastructure improvements to ensure the proper maintenance of our equipment. In the future, ERI will ensure that forward aviation infrastructure is able to accommodate U.S. Army rotary-wing aircraft and that forward motor pools and maintenance facilities are able to support M1A2 Abrams tanks. The initiative is essential to the hard work and effort USAREUR has committed to Europe, and will continue to serve as the cornerstone of our activity as we assume a deterrence posture. Through the use of ERI funding, the strategic prepositioning of a division’s set of Army prepositioned stocks and the introduction of a permanent regionally allocated armored brigade combat team and combat aviation brigade set conditions for successful USAREUR operations for years to come. These efforts demonstrate the capability and will required for effective deterrence. USAREUR works in close cooperation with our European partners and allies on a daily basis. Through forward positioning, USAREUR forces train to improve interoperability, become familiar with the environment, and build relationships that are crucial to a combat-ready force. Part of readiness includes building the relationships needed to integrate forces throughout the NATO alliance, ensuring we are able to shoot, move and communicate seamlessly with these forces. Through Atlantic Resolve, the execution of multilateral exercises such as Anakonda 16 in Poland, and the permanent presence of regionally allocated forces throughout Eastern Europe, soldiers continue to build these relationships with their counterparts every day. Atlantic Resolve is the name for USEUCOM efforts to assure our NATO allies throughout Eastern Europe. Over the course of the past year, Atlantic Resolve has matured into a sophisticated series of exercises that span from the Baltic Sea to the Black Sea. The next year promises to see more emphasis in Atlantic Resolve South as we continue to work with partners and allies to build capability, increase capacity, and strengthen relationships necessary to adopt a deterrence posture in response to any challenge. Firmly set in Baumholder, Germany, the 4th Infantry Division Mission Command Element is responsible for Mission Command of Atlantic Resolve. Staffed with 95 soldiers, the command synchronizes Atlantic Resolve operations to deter aggression, assure allies, increase interoperability, and demonstrate projection and sustainment throughout Eastern Europe. The command’s focus on Atlantic Resolve provides USAREUR with the capacity to increase activity in the south and center of Europe while maintaining our current pace of operations in the north. As Atlantic Resolve matures, we are building readiness by increasing our emphasis on collective training at the battalion and brigade combat team level. According to Army Gen. Curtis M. Scaparrotti, USEUCOM commander and Supreme Allied Commander Europe, “There has to be change in order to meet the challenges of the new environment that we see in Europe today.” U.S. Army Europe is implementing this change so that we stand combat-ready to meet the complex security challenges that Europe faces. Soldiers participate in Exercise Swift Response 16 in Hohenfels, Germany. 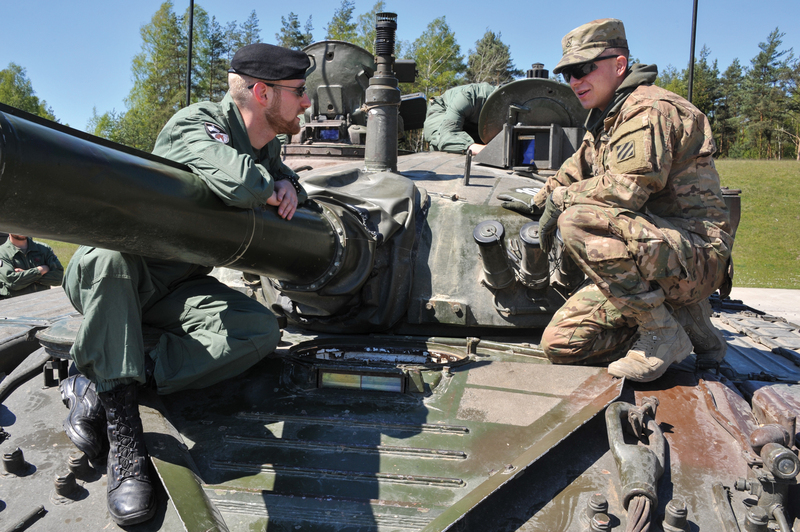 Equipment inspection is part of the Strong Europe Tank Challenge at Grafenwoehr Training Area, Germany. The 7th Army Training Command (7th ATC) consists of the Joint Multinational Training Command, the Joint Multinational Readiness Center and the Joint Multinational Simulation Center. The 7th ATC, headquartered in Grafenwoehr, Germany, provides assigned and regionally allocated U.S. forces with a unique opportunity to train shoulder-to-shoulder with European partners and allies and integrates complex tactical training tasks through simulations, maneuver and live-fire opportunities. In the last 12 months, the 7th ATC has trained approximately 13,200 U.S. forces and 14,300 multinational personnel in support of the USAREUR mission. As part of this, the training command has hosted five brigade-level decisive action training environment rotations for U.S. forces at the Joint Multinational Readiness Center over the past three years. The Joint Multinational Simulation Center supported exercise participants from 40 nations in fiscal 2016, using the latest in distributed, live and virtual simulation exercise technology throughout the entire European theater. At the Grafenwoehr Training Area, the Joint Multinational Training Command enabled the training of 24 allied and partnered countries with live-fire qualification of all major weapons systems to include tank, artillery and aerial gunnery as well as close air support for the U.S. Air Force. The 7th ATC not only prepares U.S. land forces for complex operations, but also plays a significant role in preparing European partners and allies, to include the Ukrainians, as an integral part of the Joint Multinational Training Group-Ukraine (JMTG-U). As part of the Ukraine-U.S. Joint Commission, JMTG-U is a multinational effort to develop a Ukrainian-led combat training center as that country seeks to increase its own readiness. Soldiers from the 3rd Infantry Division’s 3rd Battalion, 15th Infantry Regiment recently served as cadre at the training center in Yavoriv, Ukraine. 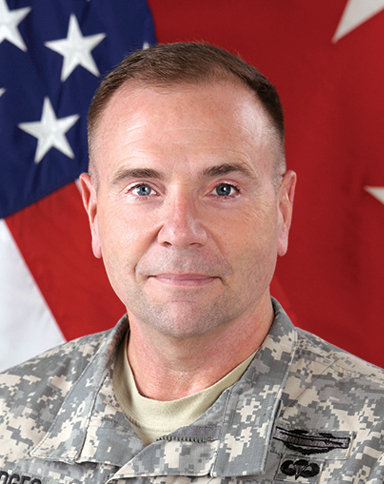 Currently, the commander of JMTG-U is a member of the California Army National Guard, which has had a formal State Partnership Program relationship with Ukraine since 1993. Ukrainian ground forces taking part in combat operations in the anti-terrorism operations zone rotate through the training center to conduct individual and collective training. In conjunction with land forces from Canada, Lithuania, Poland and the U.K., the U.S. is setting conditions to transition the training group to a Ukrainian-led, fully functional combat training center. In addition to the training opportunities provided through JMTG-U, the U.S. is providing nonlethal support to Ukrainian ground forces. USAREUR facilitated the training of Ukraine armed forces on two Q-36 radar systems in November 2015 and four in June, as well as training with unmanned aerial vehicles in order to build capacity to defend its borders. Additionally, USAREUR trained and facilitated the delivery of medical supplies and equipment, including up-armored ambulances to support the Ukrainian Ministry of Defense’s efforts in anti-terrorism operations. U.S. European Command enjoys 22 formal state partnerships with countries throughout Eastern and Southern Europe. The State Partnership Program has proven successful as USAREUR has worked hard to tie into these formal partnerships along with the full integration of the U.S. Army Reserve component contribution in several major USAREUR exercises. In addition to participating in state partnerships, the Army National Guard and Army Reserve have contributed over 11,300 soldiers to exercises across Europe this year, totaling nearly 200,000 overseas deployment training days. By creating these training opportunities for Guard, Reserve and active-duty forces, USAREUR continues to provide units with the ability to continuously train in a dynamic environment with partners and allies. Speed is a critical element to successful deterrence in any theater. It is essential to position land forces to provide our leaders with options other than a liberation campaign to retake NATO territory. A credible deterrence requires land forces to have the ability to rapidly identify adversary capability and intent; to promptly decide to use force to mitigate an adversary’s threat with our partners and allies; and to rapidly assume a position to deliver the force necessary to mitigate a potential threat. Speed of recognition, decision and assembly are critical aspects of deterrence toward any threat actor. Speed of recognition in today’s environment is more than enhancing intelligence, surveillance, target acquisition and reconnaissance in the traditional sense. It also means applying these activities in the cyber domain to detect early warnings of adversary hybrid warfare. USAREUR continues to prioritize our efforts to facilitate early warning of adversary activity in sovereign European territory. However, one area that we must improve on is the ability to challenge Russia’s deceptive presence in the information space. Russia has proven adept at the ability to weave a mixture of half-truths and lies into the fabric of Eastern Europe. A recent example of this is Russian news outlet Sputnik’s use of a photo from the U.S. Army Europe official Flickr account to imply the employment of U.S. combat forces in Donbass, Ukraine, complete with multiple integrated laser engagement system gear. The publication suggested that opposing forces from the Joint Multinational Readiness Center in Hohenfels, Germany, are taking part in combat operations in Mariupol, Ukraine. According to Scaparrotti, hybrid warfare “challenges the norms of warfare, and it challenges the authorities that we have in order to deal with this type of conflict.” In U.S. Army Europe, we must communicate the good deeds that the alliance is conducting on a daily basis to audiences throughout the theater while minimizing the seeds of doubt that Russian cyber trolls have been sowing with regard to U.S. and European activity. USAREUR will make Russia compete in the information space by communicating transparency and the truth in all that we do. Speed of decision is a second critical aspect of deterrence. In a multinational environment, service, theater and national-level decisions are often required to execute military operations. The speed of these decisions affects the success of the alliance’s ability to demonstrate a credible deterrence. USAREUR’s command relationship with USEUCOM and its habitual relationships with U.S. embassies and interagency partners throughout Europe help facilitate these rapid decisions. Relationships and constant exchanges of intelligence and information ensure these decisionmaking bodies are able to make rapid informed decisions that benefit the alliance. Speed of political decisions without perfect information is critical to the alliance. The final component of speed needed for a credible deterrence is speed of assembly. Within Europe, there are many barriers to rapid movement of personnel and equipment across international borders that allies must work to systematically reduce. Despite the Schengen Zone, an area encompassing 26 European nations that allows free movement without passport and border controls, no such arrangement exists for NATO military forces’ freedom of movement. We need a “Military Schengen Zone” to ensure speed of assembly for the alliance. We must prepare in advance to ensure that the infrastructure, transport and, most importantly, plans and processes are in place to enable a rapid deployment of forces throughout Europe for either exercise or crisis. Over the past year, the alliance has made great strides in achieving freedom of movement, greatly reducing diplomatic clearance processing times and working with partners and allies to develop movement agreements and ensure key infrastructure is in place to maximize our deterrence posture. An agreed-upon version of a Military Schengen Zone would greatly reduce friction as allied forces continue efforts to improve freedom of movement across international borders. However, more work must be done. We must adhere to set standards in Europe for rail gauges, heavy equipment transport requirements for the transport of military vehicles, and route infrastructure markings to ensure we don’t exceed the capacity of bridges to make real progress in freedom of movement. Over the next few years, USAREUR will continue to work with European partners and allies to set conditions for complete freedom of movement throughout the USEUCOM area of responsibility. A demonstrated capability to move and deliver forces is the ultimate key to deterrence. USAREUR will continue to improve speed of recognition, speed of decision, and speed of assembly as we transition to a deterrence posture in Europe. Additionally, we remain focused on taking an active role in deterring adversary aggression with our partners and allies throughout Europe. In a complex mission environment, USAREUR continues to maintain ready forces as it assumes a deterrence posture while exercising speed of recognition, enabling speed of decision, and practicing speed of assembly. By being an ocean closer to America’s strategic challenges, U.S. Army Europe stands ready to provide a credible deterrence to mitigate multiple threat scenarios in a rapid manner. USAREUR is at the leading edge of America’s efforts to deter Russia, assure our allies, and protect U.S. interests.